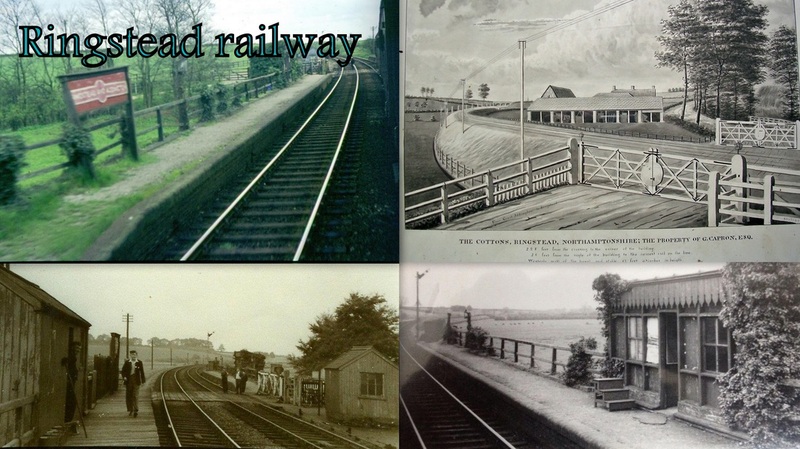 Ringstead & Addington Railway Station. 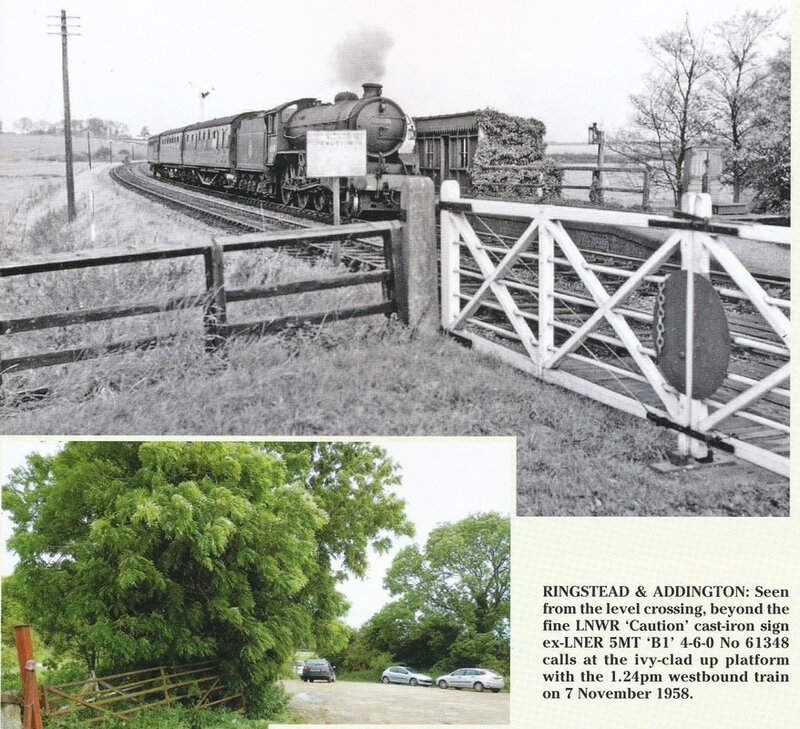 BRIEF HISTORY OF RINGSTEAD AND ADDINGTON STATION. Photo above showing the station prior to 1929 before it burnt down. The London and Birmingham railway was completed by the autumn of 1838 and immediately started considering expanding its territory to Northampton (which it by-passed by some 5 miles due to the hilly nature of the Northampton town) and then down the Nene valley to Peterborough. In 1843 the London and North Western Railway was given parliamentary assent to construct a line from Blisworth in Northamptonshire to Peterborough. The line formerly opened in Saturday 7th June 1845. The line was generally acknowledged to be a secondary mainline and regularly saw heavy through traffic but operating costs were high with a large number of manned level crossings. Iron ore trains continued to use the line until 1966. . The station itself burnt down in 1929 the same day as the Airship R100 flew over the village. The school children were let out of class to wave as it flew over.The station was never rebuilt which just left a small waiting shelter and a toilet and a couple of storage barns. The Queen did travel on this line in 1962 to visit the Duke and Duchess of Gloucester at Barnwell Castle and each station from Northampton to Barnwell was packed out with people waving flags and cheering as the train went through. She came through Ringstead station on visits to Barnwell several times. Many Ringstead school children used this railway to go the Grammar & the High School in Wellingborough as well as Ringstead folk used it if they went to work both at Irthlingborough & Wellingborough and even Thrapston. 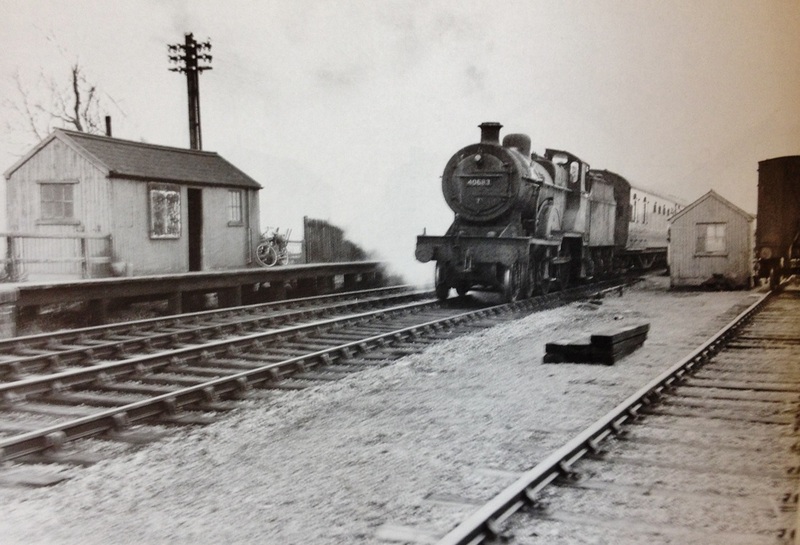 At 11.35am on Saturday 7th June 1845 the first train passed through Ringstead station carrying on board the train company directors and their families en route from London via the Blisworth junction on to Northampton station then heading for Peterborough station. The train set off at 9 o'clock and headed the 63 miles to Blisworth from London then crossing onto the new LNWR rail line on route to Peterborough, calling into Northampton station to pick up the Mayor and more corporate guests. It then proceeded along the meandering route of the River Nene and the Nene valley passing picturesque villages and the passengers must have been admiring the village spires of all the villages as it passed -Stanwick, Ringstead ,Thrapston, Barnwell,Thorpe and Oundle and passing the village of Fotheringhay where poor Mary Queen of Scotland was beheaded, then on to Stamford and its final destination of Peterborough.The cost per mile in 1845 to lay the Railway was £9.13s.6. It must be noted that Ringstead Station was not completed until 1888 but going through Ringstead there were many villagers at the station waving at the first train to go by, even if it was not to stop to pick up any passengers. 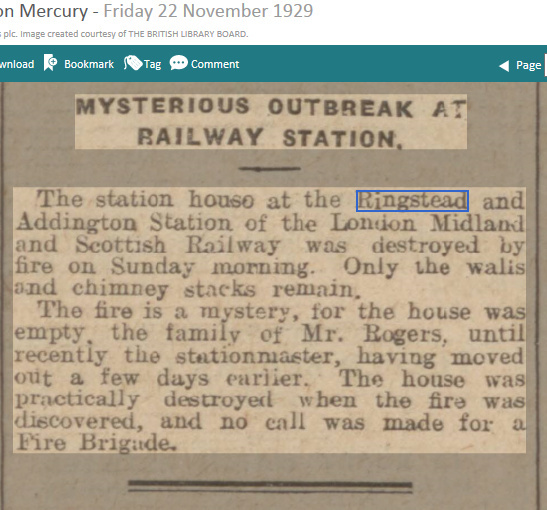 Ringstead Station lost its last Station Master and in 1908 the station house was advertised in the Mercury to be "Let out”. The slow progression and vandalism took its toll at the station house. In 1929 it was burned down. Arson was suspected, even though reports stated it was possible a passing train somehow ignited timber next to the house resulting in total destruction. All that was left at the station was a couple of upright walls and as the fire brigade was not called out nothing was saved. Outside all that was left was the small waiting room, a toilet, and two storage huts. 1888-1898 WILLIAM LEVERET...date station is built. Below is the station area showing the platform and waiting room, these were taken well after the station was destroyed by fire in 1929.The drawing here depicts how it looked in its prime. Please click the numbers below to see more pictures. Cotton farm is seen on the second picture below. 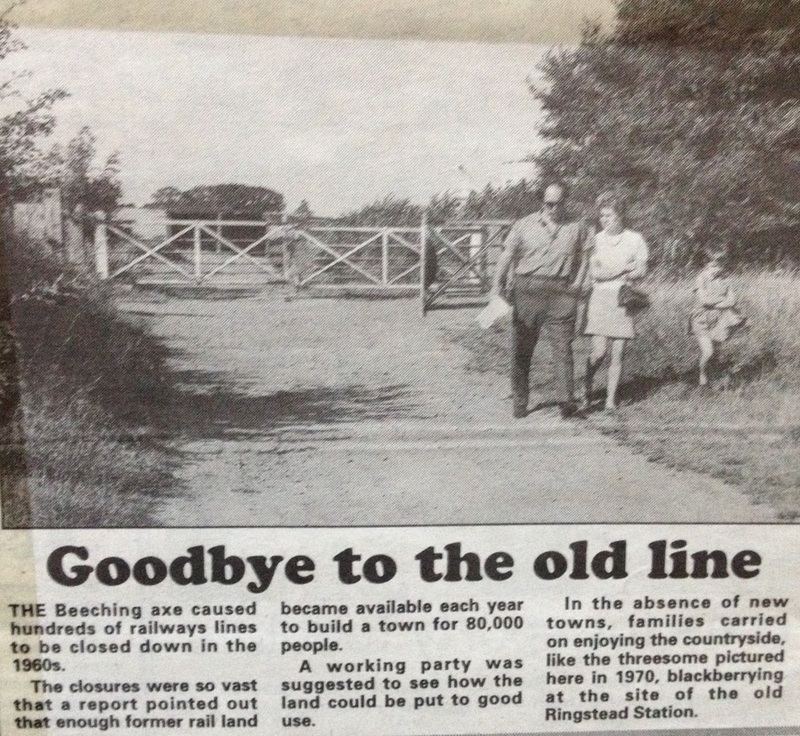 Below is a article taken from the Mercury newspaper telling the story of the opening of the line.